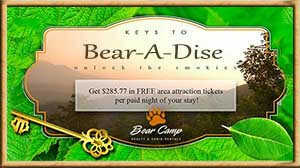 Can't Bear To Leave - Bear Camp Cabin Rentals. "Can't Bear To Leave" is the perfect name for this gorgeous 3-story, 4-bedroom 3-bathroom cabin which will sleep 14. Once you arrive at the cabin you will never want to leave. It is in the Brookstone Village Resort in Pigeon Forge where you are only 5 minutes from the Parkway in Pigeon Forge and 15 minutes from Gatlinburg. You will have paved roads all the way to the cabin and parking for 3 vehicles comfortably and would be considered motorcycle and trailer friendly only at the rider's discretion. With no steps to enter the beautiful cabin, you are going to be amazed by all the wood interior, the fine decorating touches and the all the amenities the cabin has to offer. As you enter the cabin you will have an open floor with the living room and dining room being an open to one another. After a day at Dollywood, relax and stretch out on the comfortable leather sleeper sofa or kick your feet up in the leather recliner while watching your favorite show on the Flat screen TV. On those cold winter nights grab a cozy blanket, cup of hot cocoa and snuggle up in front of the stone gas fireplace. Adjacent to the living room is the dining area where you will have seating for 6 at the gorgeous log style dining table and a fully equipped kitchen. Just off the kitchen is a King size bedroom with a Flat screen TV and a full bathroom with a tub/shower combination. The washer and dryer are in this bathroom for your convenience. As you travel upstairs, you will have your large Master suite with a King size bed, Flat screen TV, and a relaxing sleeper sofa for extra sleeping. You will have your own private bathroom with a walk-in shower and Jacuzzi tub to relax in after a long day of hiking. Also, located on this level is your own private theater room with comfortable reclining leather chairs, surround sound with a movie projector with a movie screen where you can watch your favorite movies or your favorite sports team. While you wait for your show to start enjoy a friendly game of foosball or stand-up arcade game. If you want to make movie night even more special, enjoy the stone gas fireplace on those colder nights. On the lower level is the game room with a Flat screen TV, leather sleeper sofa, a boom box and a pool table for those who are pool sharks and wanting a friendly game. You will have 2 beautiful Queen size bedrooms, both having Flat screen TV's and a shared bathroom with a tub/shower combination. "Can't Bear To Leave" has 3 large decks where you can enjoy you morning coffee while taking in the beauty and partial mountain views. Or just enjoy sitting in one of the many rocking chairs while you are listening to the natural sounds of nature the smokies has to offer. After a long day sight-seeing, enjoy the bubbly hot tub located on the lower level deck and soak all your cares away. In summer, Brookstone Village Resort offers pool access and a basketball court for those days you just want to relax with family and friends while the kids enjoy playing in the pool or a game of basketball. If you are looking for a great, relaxing, and convenient cabin for your next mountain vacation, then look no farther than "Can't Bear To Leave" because that is what you will be saying on your last day at this cabin. What are you waiting for? Book this gorgeous cabin today before it is to late!!!!!!! It was overall a great experience. Your cabin was very comfortable, And had everything we needed.